in the photo, is painted the same light grey that the Navy painted the lower surface of WWII airplanes to make them difficult to see against a blue sky. And even harder to photograph, as this horse was [in April of 2014]. I’ll write parenthetically that I remember seeing that horse weathervane since my childhood and like many of us, have heard over the years that a prior owner and the probable builder of the home was an executive, or a relative of an executive, of the Socony (an acronym for Standard Oil Co. of New York) Mobil Oil. Sometimes Saucony. And in the past, I’ve taken a run at writing about it, and on every occasion honored the wishes of the home’s owner for privacy, and left it alone. Enter now some confusion over winged stuff – I wrote “SoconyMobil” but a number of readers said, incorrectly, “No, no; that equine is the logo of Flying A,” which is sort of interchangeable with Associated and Tidewater Oil depending upon where the readers spent their youth. I, like many of us, pumped gas for Myneer Walker and Jimmy Melarkey at the Flying A on the S/W corner of Liberty and South Virginia Street. And several readers claimed, incorrectly, that our flying horse was on the old fluted column remnant of Ernie’s Flying A Truck Garage on East Fourth Street. All old Flying A’s incorporated fluted columns. Misha Miller, who has forgotten more about Reno than I’ll ever know, aligned with this crowd. But, we’re looking for a winged horse, not a winged “A”. Time marched on, actually only a few days but the earlier text sounds more dramatic. I busied myself trying to learn who would put a service station logo on the weathervane of a beautiful Reno home, one of the nicest for sure, when it was built probably in the late 1930s (the assumption that it was a Standard Oil exec is pretty well carved in stone.) The year it was built, the owner, the architect, the contractor – all seemed to be pretty obscure. As I write this, I have some pretty good clues that I can follow up this first week in February, and have some messages out to those associated with the present owner who will probably fill in some blanks. 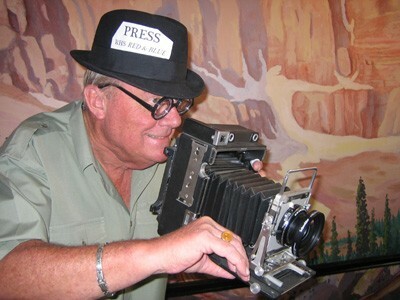 The notes right now lead outward from a Riverside Hotel exec with ranching ties around the state, to another family – which may actually be an offshoot of the same family – who owned it until sometime after 1945 and reportedly owned the former Flick Ranch along the Truckee which later became the site of Bishop Manogue High School. REG 1941 Aug 1 page 3. Building permits for new construction for July. Approximately $80,000 was paid for the R. B. Callahan home at 843 Marsh ave in a recent sale, it was indicated by a deed filed at the country recorders office Tuesday. Purchasers of the home, one of Reno’s most elaborate are Mr. and Mrs. Bert Reddick, according to the filed deed. The house was built a few years before the war. Purchase of the former Raymond Callahan house at 843 Marsh Ave by [TEXT REDACTED] of Reno from Mrs. Vivian Reddick was revealed yesterday. It was bought by Mr. and Mrs. Bert Reddick a year or so ago. REG April 10, 1975 page 5. Home tour by American Association of University Women. One of the homes featured was the home at 843 Marsh Avenue. 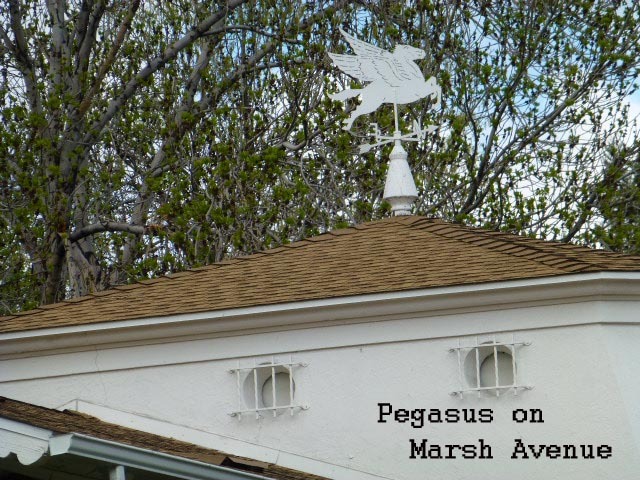 Raymond Callahan, the businessman who owned the Flying A, Gas Station, had a Pegasus on a weather vane on his Reno home during his ownership of it. Now: Another reader Misha Miller responded, with the information that the Socony-Mobil horse on the roof was placed there as a good natured in-your-face to the owner of a Flying A Station; something for him to look at each night as he came in the driveway. Callahan did own what became Ernie’s Flying A on East Fourth Street. And Misha knows…if her theory’s right, and it well may be, it answers why I could never make a link to a Standard Oil exec in title – there wasn’t any!